The Rehabilitation Program "Help on bee wings"
All-Ukrainian Nongovernmental Organization "Brotherhood of Ukrainian Beekeepers" is now implementing its own initiative - Program "Help on bee wings." 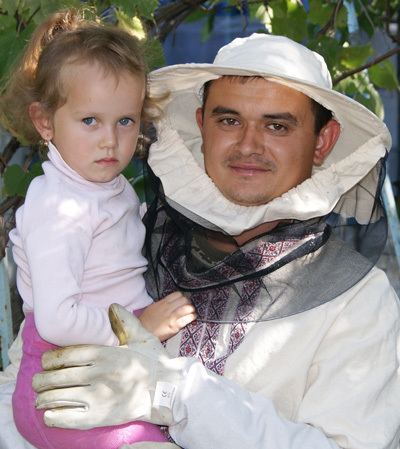 to encourage the war (Anti-Terroristic Operation) veterans of Ukraine to believe in existing opportunities to have normal social life in the community through gaining skills and experience in beekeeping with help of the beekeepers of this nongovernmental organization in certain regions of Ukraine. The targets or vision of the Program "Help on bee wings" is to involve the war veterans into the active beekeeping community of certain regions, those who suffered physically and morally, and also have difficulties in psychological, social and occupational (vocational) rehabilitation, promote professional and business contacts of young trained professionals in their further life. Young and active patriots of Ukraine went to defend Ukraine from the enemy - Russian soldier and mercenary without any hesitation. Ukrainian nation endured a lot from its enemies during its glorious history, but always came out a winner! Ukraine suffered losses during wars, and during famines. These losses weakened the nation physically and economically. However, the spirit of the Ukrainian nation is unconquerable, and the desire for freedom is in their blood. Annexation of the Crimea, invasion of Russia into the eastern region of our country is a misfortune for Ukraine, for Europe and the whole world. 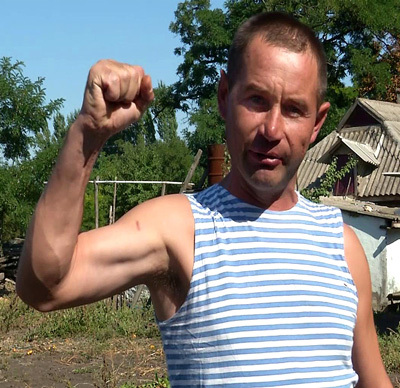 So our Ukrainian soldier-patriot stood up to defend his homeland. 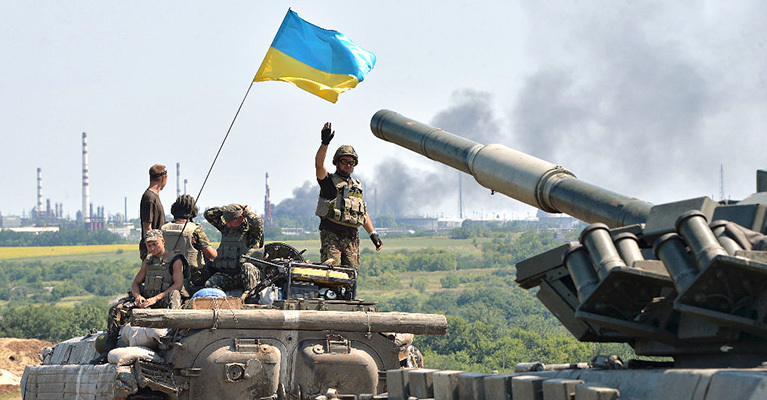 Numerous deaths and injuries of Ukrainian soldiers do not leave world indifferent. National and world volunteers, by helping them, demonstrate understanding and solidarity; by doing everything possible what they can, they do not less responsible and heroic work than the soldiers. Mission of the volunteers consist in helping the soldiers to come back home ALIVE! Our boys come back young, but they turn gray with sorrow, young but with pain and sadness in their eyes and hearts, young but injured. Courageous surgeons see them in their most dreadful moments of pain and hopelessness, when they have to decide - to live without legs or hands. Doctors are first who try to pull the soldier out of continuing psychological nightmares when soldier becomes a witness of shooting and death of his fellows. What is next? Next – they have to live with it. Every veteran wonders how can he live NOW in a peaceful life, what can he do now, where should he go? Become a part of a social life with BEEKEEPING! For the question of the soldiers: "How can I live NOW in a peaceful life, what can I do now, where should I go?" we say: "Learn to overcome all existing doubts and moral gravity, forget about the past and try today to help yourself, get out of depression and learn something new in order to be meaningful firstly for yourself, family, and then be useful for the society". We really suggest you, veterans, to join us, beekeepers, learn our occupation, acquire knowledge and skills, love a bee and it will serve you and it will improve your health and help to generate income. It is quite real, it is a decent path! To be a beekeeper is a hard work. However, it is a respected and profitable work! Start with our help, and then together with the beekeeping community! You need help and knowledge at the beginning, the psychological and professional support. The Program "Help on bee wings" was launched in 2015 in Mykolaiv region – a fertile region for carrying out beekeeping. The branch of All-Ukrainian Nongovernmental Organization "Brotherhood of Ukrainian Beekeepers" in Mykolaiv region was the first who implemented the Program. In order to see and feel whether the suggested Program is currently important, the activists of the organization gave their own charitable funds and purchased hives, wax, bee colonies, queen bees, required tools, clothes for implementation of the Program for four participants. Practically, a private apiary was established for each participant for charitable funds. Each participant of the Program was provided with special care and attention of the mentors – acting beekeepers of the Branch. They taught, gave consultations, pieces of advice, and shared experiences. Every veteran received an individual program depending on his physical abilities. Thus, a season is complete and we may publicly present the results! And plan the future! The participants of the Program in Mykolaiv region were: Vitalii Matiukhin, Serhii Masian, Serhii Honcharov, Artem Panov. All boys are young, but full of pain of torn souls and bodies. All are simple guys raised on rural labour. All have families, children and bear responsibility for them. They do not want to talk about the war, but the horrors of war are still with them. All became "wards" of the beekeeping community, in order to find their own path in life in a new status and become an example of will and strength for their children. The Head of the Branch Viktor Zhevanov, as a curator of the Program in Mykolaiv region is satisfied. His "peace team" of veterans have coped with it. All guys undertook a one-year practice, found out the basics and specific aspect of beekeeping, even bees rewarded them with honey. Psychological nightmares are fading and the veterans are positive-minded. Their children do not ask about war. They ask about interesting bees, about their life in the hive and whether a bee sting is painful. Veterans do not feel pain because they are recovering while gaining professional skills. Buzz of bees, work in a field among flowering fields, taking care of small and crafty bees, in order to prevent their illnesses; it is today something completely new and desirable for our veterans, who morally and physically were on the brink of survival a year ago. 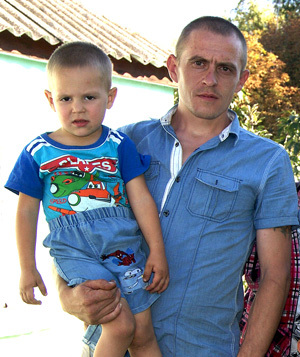 Although Serhii Masian had numerous burns in the past and overcame surgeries, his hands are still not working and he still needs treatment. He learns theory and his wife Svitlana tries to implement it in practice. And we can say it about every veteran who participates in the program - their families are interested and enjoy their success. Mothers and wives dry their tears and everything is getting better. Faith in themselves and work with bees help to overcome fear, pain, uncertainty, disbelief. Body of Serhii Honcharov was torn to pieces by explosions and doctors managed to save his life. Now he is fond of bees and He managed to overcome depression what seemed to be hopeless. Serhii advises everyone not to be fond of the bottle, but to go to the bees, and move with the beekeepers forward without looking back. Memory will remind of the horrors of war for a long time and body will hurt because of injuries, but eyes have to see the sun and the joy of the children that the father is alive and works". Only time can heal wounds of the soul and only than such memories would not be dreadful. They need work that will help to pull themselves together. And we do it all for the war veterans in the Program "Help on bee wings". We believe that the buzz of bees, sun and flowers is exactly the space that is able to capture a person and heal grief and sorrow. Acquiring knowledge of a new profession, a new attitude to oneself, to a family and to other people is also being formed. So, having mastered beekeeping, the war veterans will be able to maintain a family. What is more, the beekeeping products will contribute to improvement of their health. The first beekeeping season of the Program "Help on bee wings" has been successfully completed! We continue the Program "Help on bee wings"
We are inspired by the positive results and mood of the war veterans who have already passed the first and the hardest stage of a craft, new to them. Besides, the implementation of the Program will encourage the war veterans to promote the environmental improvement and to join the team of people who cares about conservation and protection of bees. The mission of saving of bees is very important. “If the bee disappeared off the surface of the globe, then man would have only four years of life left. No more bees, no more pollination, no more plants, no more animals, no more man.”, - Albert Einstein. What shall we do for it? We are intend to attract new participants to the Program from other regions of Ukraine - Vinnytsia, Cherkasy, Kyiv, Odesa, Ivano-Frankivsk, Lviv, Chernihiv, Ternopil regions. We appeal to the philanthropists with a request to support the Program "Help on bee wings" financially, because the participants at the first stage are provided with everything for free. We use charitable funds to buy everything necessary (full optional hives, bee colonies, clothes, and all required equipment) for the participants of the Program for the start and continuation of the beekeeping practice. Mentors carry out their work on a volunteer basis. All received funds will be used to expand the Program, to attract new participants. The Report on use of the received funds will be posted on the official website of the Program "Help on bee wings" and on the page in a facebook. Beneficiary:NGO "BROTHERHOOD OF UKRAINIAN BEEKEEPERS"
Bank of beneficiary: PJSC "CREDIT AGRICOLE BANK"
Correspondent bank: JP Morgan Chase Bank N.A. Payment description: "Non-repayable charitable donation"
If the benefactors are willing to visit the participants of the Program, to see them and to communicate with them, what is necessary and desirable for our veterans, they will be grateful and will assure you that everything is done not in vain, and it is a GREAT mission full of GOOD, COMPASSION, FAITH and HOPE. Every participant of the Program, the war veteran, will share the joy that he overcame the ultimate test - he believed in his place in life, believed in the opportunity to become the person, he wanted to be before the war - a successful full member of the society.